As much as Jean Patou's Joy perfume was created in 1930 to combat the Great Depression, it doesn't smell exuberant to me. I get the American-ness of the rose, but it is also an English rose, and the jasmine only makes it smell more like an English-flavored East Coast garden. After breathing Montale's Middle Eastern rose and jasmine for months, this has a nostalgic edge for me; a scent to bridge past and present, motherland and U.S. Like Patou's Sublime, Joy went immediately to my wish list. I can admit I think in terms of houses when I think of perfume. For years, Givenchy was my house. I wore Organza, and had little vials of Extravagance, Organza Indecence, Amarige, and Ysatis (didn't like Ysatis though). Tried "new" L'Interdit, Hot Couture, up to Very Irresistible...but at one point, I felt the house of Givenchy had modernized far too much. Montale has been my house since last year, owing to their Middle Eastern essences, swirled together with a slight French edge. Patou, I've finally put a finger on it...is more emotional in appeal than either Givenchy or Montale. I just felt a jolt of happiness smelling Sublime after all these years (ten, easily, likely more). It was like a friendly smile. Joy to me dates back decades; I'm fuzzy as to when I smelled it before (Virginia, East Coast, a perfume for ladies with pocketbooks and compacts). Yet there is the same radiant warmth of that friendly smile. (Not to scale.) One of my local bead shops closed down, more than a year ago, and I've yet to replace it with another brick & mortar shop. The markup around here, outside that one shop, is terrible. I gave up, and began the search for good etailers. This stuff worked out pretty well. I'm not even sure I miss my L'Oreal Feria. 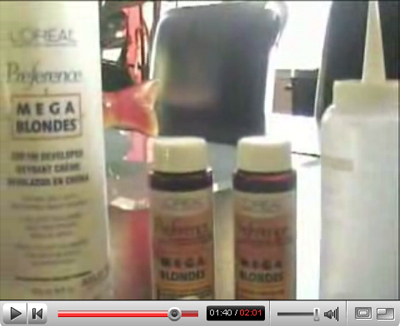 Preference Mega Blondes has its own tricks...you have to be more careful applying it, since it lifts more than Feria. I fried the top layer of my hair when I first used it. Well it didn't come out crispy, exactly, just lighter than I'd wanted. Fortunately I've cut at least four inches off the bottom of my hair over the past few weeks, so it doesn't matter. 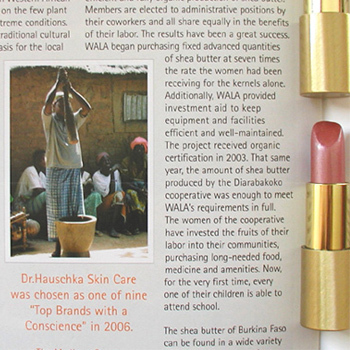 Dr. Hauschka's #09 lipstick (Dolce). More versatile than their #01 Amoroso lipstick, which is too much color for my etiolated winter skin. Dolce is perhaps a tad too warm to truly be my grail, yet there is the niceness of it: tasty natural ingredients, pleasant heavy gold-colored case, overall lip conditioning. Thinking of replacing this with their Adagio lipstick (#07), which is a sort of complex pink, though I'll probably use up Amoroso first (at the rate Dolce is going, it should last well into summer).